Chances are that one of your complaints about your current dishwasher is how loud it is. Dishwasher manufacturers rate their sound levels in dBs (decibels). Old-fashioned dishwashers tended to rate around 80 dBs, which is actually as loud as the garbage disposal. Today dishwashers run from 46-60 dBs. The lower the level, the quieter, and more expensive, the dishwasher. It’s important to consider how much the sound of your dishwasher can interrupt your household activities. You should also consider the controls to operate the dishwasher: do you want front facing or integrated controls? The front facing controls are a classic look that you can find in relatively inexpensive models. Some people like being able to see the buttons easily, but sometimes they can get pushed too easily by leaning up against the dishwasher or by curious little fingers. The integrated controls give you a sleek and seamless look by hiding the buttons from little fingers; however, it can be difficult to tell when the cycle is over and the buttons are often smaller. 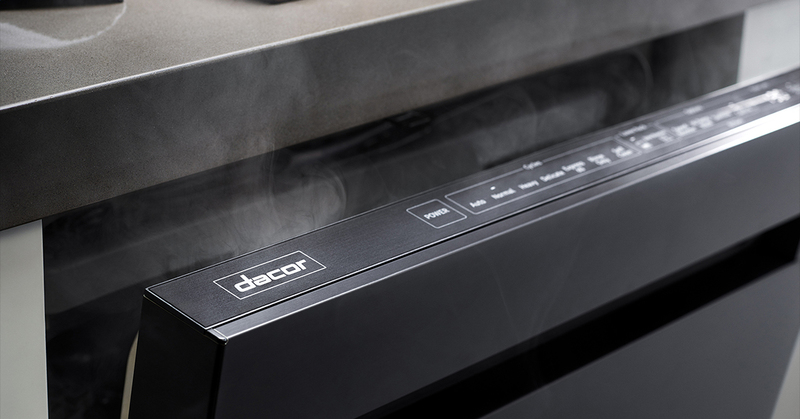 Some models with integrated controls also come with a recessed handle for the ultimate sleek design. The biggest choice you have on the inside of the dishwasher is a stainless steel tub or a plastic tub. Today manufacturers are making the inside of the dishwasher stainless steel, especially in their high-end models. The stainless steel tubs are shown to be more durable and run quieter, and they also eliminate many of the major leaks that happen when the plastic tubs get cracked over time. Ultimately, however, the tub type doesn’t impact the overall cleaning power of the dishwasher. You should also consider how many dishes you want to fit in the dishwasher on a regular basis. Manufacturers usually list a dishwasher’s capacity on their website. You’ll notice it’s given in terms of the number of place settings it can fit. 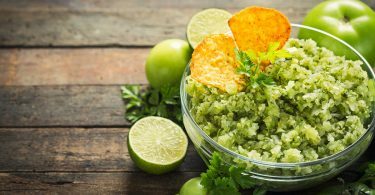 According to the Association of Home Appliance Manufacturers, one place setting consists of a large dinner plate, a small snack plate, a saucer, a bowl, a coffee cup, a drinking glass, a knife, two teaspoons, a dinner fork and a small salad fork. Most full-size dishwashers hold between 12 and 16 place settings. 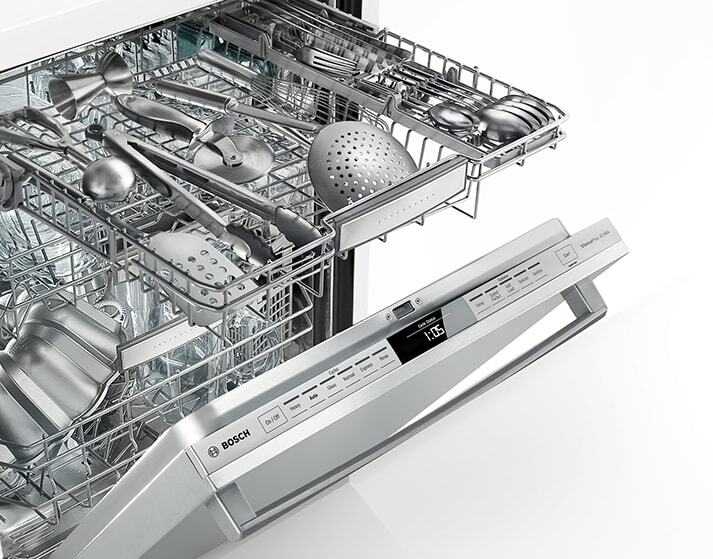 In order to increase the capacity, many dishwasher models also offer a third rack, a thin rack at the top of the dishwasher above the standard top rack. 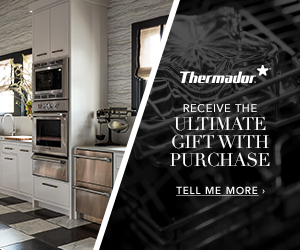 This allows you to take advantage of every inch of the dishwasher interior. It can also be a great place for silverware, utensils and plastic lids. But if you’re not used to having one, sometimes you can forget to unload it. Another important consideration is the external look of the dishwasher. Dishwashers come in a variety of finishes. If you’re only replacing a dishwasher, it’s best to match the color and finish of your existing appliances. 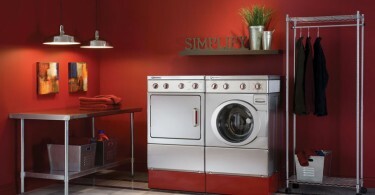 If you’re buying all new appliances, make sure you explore all the amazing new finishes that are out there. You have many more options than just stainless. 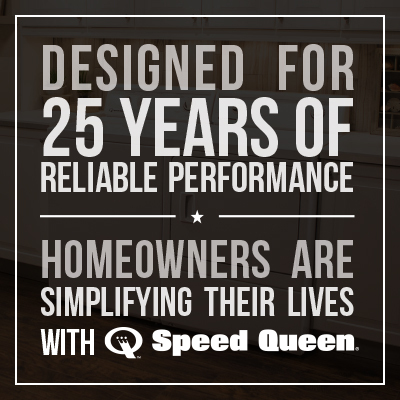 For example, you can get panels on the appliances to match your cabinetry for a seamless kitchen design. This allows your eye to travel to other focal points you choose, like a hood or a pot rack or a colorful backsplash. If you want your appliances to make a statement, consider the new Café line that has many options for finishes that allow you to create a custom look for your kitchen. The dishwasher’s main task is cleaning, and today’s dishwashers have many special features. Many have customizable cycles, so it’s important to know which types of dishes you expect your dishwasher to clean. 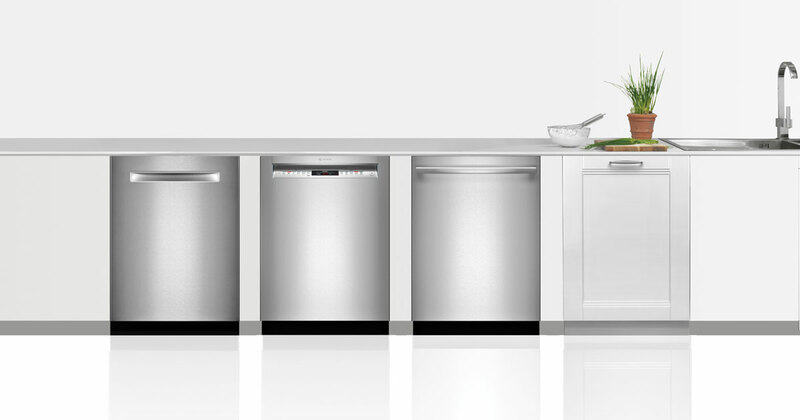 Dishwashers come with cycles that clean glassware, china and crystal, or pots and pans. It’s also a good idea to have drying cycle options or an option for speed wash to allow for shorter cycles, which help you control your energy costs. Bosch dishwashers even have an Auto cycle that senses the soil level of the dishes and selects the appropriate wash cycle. Instead of custom cycles, some dishwashers come with custom wash zones specially designed to clean specific types of dishes. Bottle washing jets are part of GE’s latest dishwasher design. These are dedicated jets designed to clean the insides of reusable bottles. Wi-Fi Connectivity – This feature integrates your dishwasher into your connected smart home. From your smartphone or tablet, you can start wash cycles, monitor performance and check cycle status. 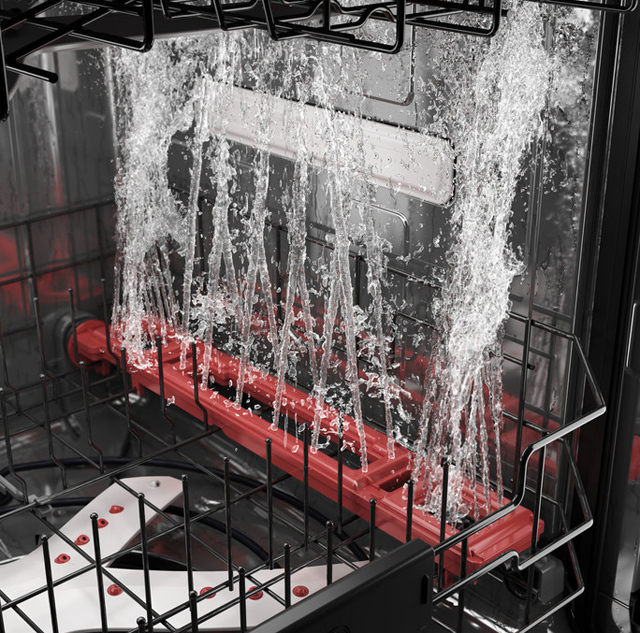 Your dishwasher can also tell you if maintenance is needed or if leaks are detected. You can also lock or unlock the dishwasher door from anywhere, which is especially helpful when you have toddlers. Some are even compatible with your voice control systems like Amazon’s Alexa and Google Assistant. 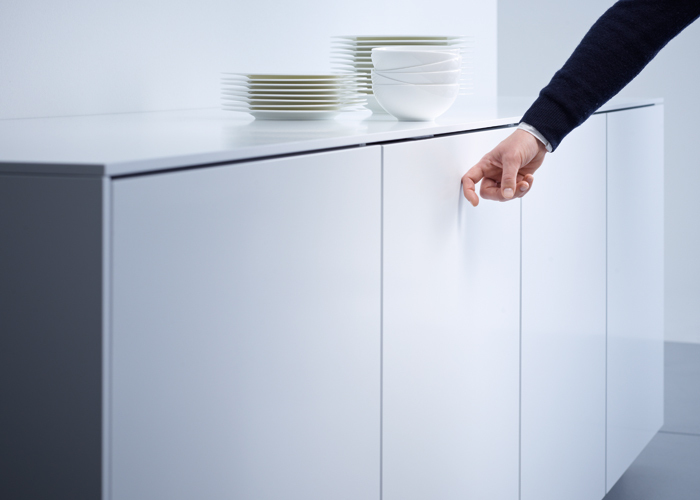 Miele Knock2Open – This dishwasher has no external handle. You simply knock to open it. It will also automatically open when the cycle is finished in order to finish drying. DishDrawer Dishwashers – If you only do small amounts of dishes at one time, a DishDrawer dishwasher might be a good option. It’s more like a drawer than a traditional dishwasher and is perfect for small loads. Disposers – This is a garbage disposal in the bottom of the dishwasher that can grind up food when you or your kids just don’t want to pre-wash the dishes before you put them in the dishwasher. Energy Efficiency/ Sensors – This option can help you run small loads or even just the top rack. 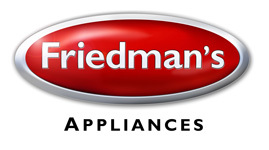 When you are ready for a new dishwasher, my best tip is to come into Friedman’s Appliance to let our experts help you navigate all the options. Plus you will get to see all of these great features in person before they are delivered to your home.